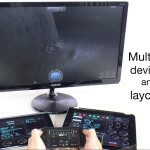 CCP turns your iPad or iPhone into an extension of your computer’s controls, helping you optimize the way you operate complex programs, play games, and everything in between! The power is in your hands. 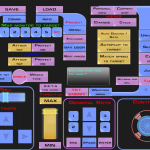 You are free to create inputs that instantly carry out complex commands, decorate created GUI layouts as you need – feel free to share the skins you make too – and even send and display data in real-time right on your CCP interface. Create multiple layouts for use with different programs and/ or games – each complete with virtual controls in the form of labeled joysticks, knobs, buttons, slide controllers, and which ever other interface elements you might need. Established commands (i.e. Ctrl + Alt + Del) can be re-created as single-button commands as well. Since CCP is capable of receiving data from your computer in real-time due to a handy public API, you can go above and beyond simply creating enhanced controls, and customize the actual programs or mod the actual games you love to show program or in-game data right on your iPad! Don’t limit yourself to your keyboard. Get CCP: Custom Control Pad and evolve the way you control your favorite games and programs on PC and Mac. No more need to memorize hundreds of keyboard shortcuts for various applications and games you use in your daily PC life. Simply create new controls for all of them with CCP! Control your PC / Mac wirelessly. Turn your iPad or iPhone into a customizable keyboard / joystick or both together! 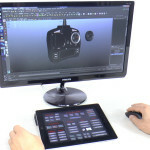 Create and use Fully customizable virtual joysticks, set ranges, sensibility etc. directly on CCP and see the effects immediately in your games. 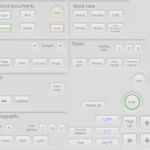 Create, edit and share infinite layouts to control your favorite applications and games. 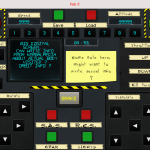 Add buttons, virtual joysticks, sliders, labels, and other graphic elements to your layouts. 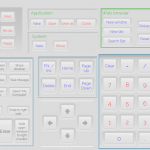 Fully customize layouts with fully controllable skin editing options. Free Skin Creator application for PC/Mac. Six “default” high-res skins included. 2 finger swipe function to switch between layout in folders. Create multiple layouts for a single game / application, and rapidly switch them according to your needs. Immediate use options via a collection of “default” layouts that ship with the application (over 40 available in version 1.0). Downloadable layouts offered through other users via in-app server browsing. Connect layouts to specific applications or games enables automatic application – layout tethering upon application/ CCP start-up. Import images from your camera roll and use them as layout elements! Connect multiple devices to a single PC/Mac, allowing you to use all the touch screen space you can gather! Extensive font support – Use fonts provided by skin or browse our extensive font library. Folder options for easy organization. Public API support – enables applications and games on PC/Mac to send data to CCP that you can use to connect the app and use it to display real-time data. Symbol support – no more going crazy trying to find out how to write symbol on your PC.